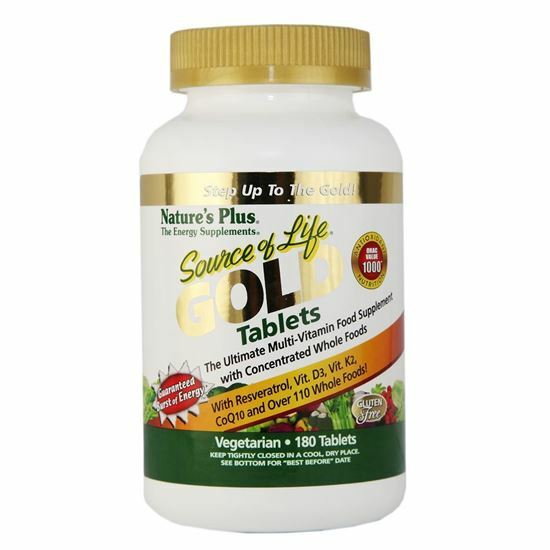 Source of Life GOLD is now the gold standard for whole food-based multivitamin supplementation. With revolutionary new all-natural ingredients and more Energizing, Antioxidant, and Anti-Aging power than ever before, Source of Life Gold will change your life with an unparalleled Burst of Life and Burst of Health! Source of Life GOLD represents the next quantum leap in whole food multivitamin supplementation. Now, Source of Life GOLD builds on all of the natural nutritional technologies embodied in Nature’s Plus’ pioneering Source of Life, Source of Life Red and Ultra Source Life formulas. Exclusive to Source of Life GOLD is OptiMicron Technology, which packs up to 10 times the nutrient concentration into each tablet, mini-tab or capsule while still dissolving rapidly for optimal absorption. 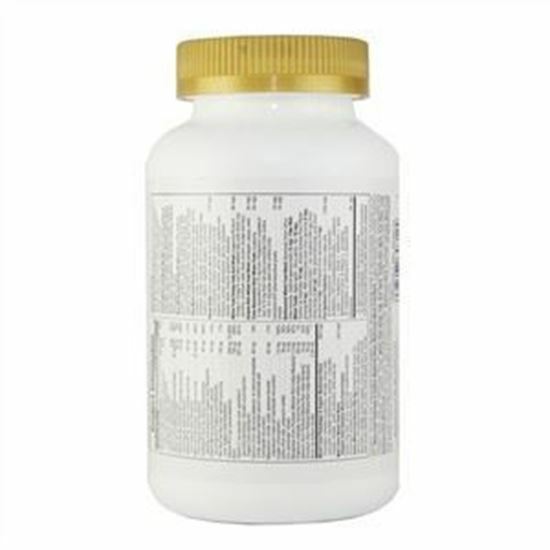 Vitamin A (as beta carotene; from spirulina and Dunaliella salina: beta carotene, alpha carotene, cryptoxanthin, zeaxanthin, lutein) 15000 IU,Vitamin C (as ascorbic acid; esterified C [ascorbyl palmitate]; naturally occurring from Organic Gold Standard [amla (Emblica officinalis) fruit]) 1010 mg,Vitamin D3 (as cholecalciferol) 1000 IU ,Vitamin E (as d-alpha tocopheryl succinate) 250 IU,Vitamin K2 (as menaquinone-4, menaquinone-7) 100 mcg ,Thiamin (as thiamine HCl; naturally occurring from Organic Gold Standard [guava (Psidium guajava), holy basil (Ocimum tenuiflorum), lemon]) 30 mg,Riboflavin (as riboflavin; naturally occurring from Organic Gold Standard [guava (Psidium guajava), holy basil (Ocimum tenuiflorum), lemon]) 30 mg,Niacin (as niacinamide; naturally occurring from Organic Gold Standard [guava (Psidium guajava), holy basil (Ocimum tenuiflorum), lemon]) 125 mg,Vitamin B6 (as pyridoxine HCl; naturally occurring from Organic Gold Standard [guava (Psidium guajava), holy basil (Ocimum tenuiflorum), lemon]) 30 mg,Folic Acid (as folic acid; naturally occurring from Organic Gold Standard [guava (Psidium guajava), holy basil (Ocimum tenuiflorum), lemon]) 425 mcg,Vitamin B12 (as cyanocobalamin) 1000 mcg ,Biotin 300 mcg ,Pantothenic Acid (as calcium pantothenate; naturally occurring from Organic Gold Standard [guava (Psidium guajava), holy basil (Ocimum tenuiflorum), lemon]) 125 mg ,Calcium (as organic chelates from Spirulina platensis, Dunaliella salina; complex) 250 mg ,Iodine (from kelp, potassium iodide) 150 mcg ,Magnesium (as whole brown rice amino acid chelate, complex) 125 mg,Zinc (as whole brown rice amino acid chelate, complex, picolinate) 15 mg,Selenium (as whole brown rice amino acid chelate, complex) 70 mcg,Copper (chlorophyllin; as whole brown rice amino acid chelate, complex) 4.5 mg ,Manganese (as whole brown rice amino acid chelate, complex) 4 mg,Chromium (as whole brown rice amino acid chelate, complex) 120 mcg,Potassium (as whole brown rice amino acid chelate, complex; naturally occurring from spirulina) 60 mg.